Pulling my shawl a little closer around my shoulders, I hunched against the smooth cold earthen wall. The weather simply had not let up in days. While we had supplies for a week, two if we really stretched the water, we needed to get out of the cramped safety hull. Jimmie had been laying stretched out next to me, I picked his feet up and slid them into my lap under my heavy shawl. This season of dust storms started blowing during the coldest winter on record. The dust is so fine, it penetrates everything it comes into contact with. With wind gusts up to 70 mph, you cannot help but breath it in. Like breathing on the end of a sand blasting hose, it tears up your lungs. The children have it the hardest. Some little ones have only ever know the harsh weather patterns we now have. I am old enough to have a vague memory of still star filled nights and hot moist afternoons laying in the grass staring at the same cloud for what seemed like hours. Initially, GreatGran would tell stories of the dust bowl days of her youth. 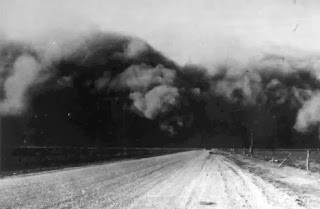 The Great Depression, the dust storms, and hunger across the nation. She would tell us how they found that Mother Earth needs her grasses to hold the soil. She needs the prairie dog to enrich the soil. Once again, corporate greed ignored the lessons learned by past generations. The wind gusts, dust pounds on the outer most boards protecting the seals. The dust pounds trying to take revenge on those of us who have persevered and lived this long. This is a worse drought/famine than in GreatGran’s time. This time China, Russia and the United States have ignored the needs of our planet…all three of the “great nations” have extreme drought. There isn't going to be a “hero” this time. Everyone is hungry. We each in turn told one another of dreams we've had, whether they were night dreams or days dreams it didn't matter. What mattered was that we talked. We couldn't forget to talk to one another, then we would simply become objects to one another and risk our very humanity. When it came my turn I spoke of my memories; sun drenched days basking in the tall grass at the edge of the garden as we plucked the sweet baby corn from their stalks, still moon swept nights with the windows open watching the curtains for that first slow whisper of a breeze, lying in bed listening to the birds soft morning songs rousing the world from sleep. I told many more stories that night than I had in the past few years, I guess I was a bit nostalgic. Coughing, I dragged on. I wanted them all to know. Masterfully written story and heartfelt sentiment, exactly what I would expect from your heart. The idea is certainly a possible future, yet the optimist in me says we will get it right before it's too late and if not, then it will be God's will. Thank you Ms.! I thought of you as I wrote my "love of all things summer"
I like your twist of anti-bucket list! So much nicer to think of celebrating waking up instead of making sure we get things checked off before we die! We, collectively, need to stop going through life as Zombies! Thank you for taking the time to read my post.